Review by AllTheBestFights.com: 2018-05-20, nice and tough fight between Ryoichi Taguchi and Hekkie Budler: it gets three stars. The Wba and Ibf light-Flw champion Ryoichi Taguchi entered this fight with a pro record of 27-2-2 (12 knockouts) and he is ranked as the No.2 light flyweight in the world (currently the #1 in this division is Ken Shiro). He suffered his last defeat when he faced Naoya Inoue in 2013, since then he has collected nine victories and one draw, against Carlos Canizales at the end of 2016 (Taguchi vs Canizales); after this fight he has beat Robert Barrera (Taguchi vs Barrera) and Milan Melindo (Milan Melindo vs Ryoichi Taguchi). His opponent, the former world champion in two different weight classes Hekkie Budler, has an official boxing record of 31-3-0 (10 knockouts) and he entered as the No.6 in the same weight class. He fought twice last year defeating Joey Canoy and losing to Milan Melindo (via split decision, Milan Melindo vs Hekkie Budler). 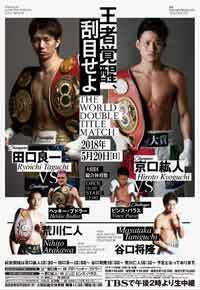 Taguchi vs Budler is valid for the IBF and WBA Super World light flyweight titles. Watch the video and rate this fight!